Three years ago, the Nero Virus turned 80% of the world's population into flesh eating biters. The biters want one thing, to devour and feast on the uninfected. A few survivors live on the Isle of Smythye one of the last bastions of humanity. Today, I'm interviewing a character from my dystopian / post apocalyptic novel Wisteria. We were supposed to get Wisteria, but she couldn’t make it. So we’ve got her mother. B: Brilliant. What’s your name? L: I'm called Omolara Kuti or Lara for short. B: Does it mean anything? L: Yes, Kuti is Yoruba and means death cannot kill. B: I hear Lara may not be your real name. L: (smiles) It isn't, but my real name isn't any of your business. B: Where were you born? Where do you call home? L: I was born in General Hospital on Lagos Island and I used to call Lagos home. Now the Isle of Smythe is the only home I have. B: What is your most treasured possession? L: I treasure my family the most, not that they’re my possessions. I’d do anything for them; even kill for them if I had to. B: Whoa... but you've never done that right? I mean...kill someone to protect your family. B:What or who is the greatest love of your life? B: So what do think about Wisteria's relationship with Bach? I'm sure your daughter hanging out with a Supernatural must be an interesting experience. L: Over my dead body. There is no relationship between Wisteria and Bach. None! And to answer your question about killing someone, Bach is at the top of my list. If I find he's been seeing Wisteria, he will end him. Just so you understand I’m serious, I used to be solider and I’ve taken people down before. B: Seriously? Aren't you overreacting? L: No. His people are dangerous. B: Why are they so dangerous? It’s not like they eat people or hunt us. L: They hate all humans. I’ll never forget the night the Family's empirics broke into my home and killed my first husband and took my first child. I wasn’t strong enough to protect them them, but I am now and I'll never let those freaks near my family. B: And when you explained this to her, what was her reaction? L: I told you, she's sixteen, so I won't burden her with something so heavy. I'm her mother and she'll do what I say. B: Even when you lie to her? L:(Laughs). Especially when I lie. Don't look at me like that... I lie to protect her. L: Listen, I didn't agree to this interview, so you could lecture me on how to be a mother. I'm getting out of here (leaves). B: Er... it think we are done? A few people really hate Lara, so if you do read the book, I'd like to know what you think. Thanks for the giveaway. This is a genre I don't know much about, so I am learning. Thanks for stopping by. I don't professing to be an expert. I'm figuring my way through it. I am new writer, so you probably haven't heard much about me. Pauline, I hope you do check my book. Wow! This book sounds good! Great interview Bisi! Great to see more of Lara! She wants to be in control of Wisteria, doesn't she? After Wisteria I thought she may have a love of her life..... Interesting! Yeah, Lara does a several loves. I'm hoping once I finished the Wisteria series, I'll write a bit more about her mother's demons. 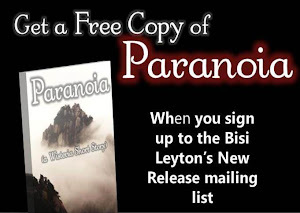 And by the way, I've written a Wisteria short story, called Paranoia, I'm releasing free in a few days. In case you're interested. YAYYY! Dystopian!! Thanks for the giveaway! I hope you find time to check out the book. You are total welcome. I hope you stop back. I can understand how she feels , A mother will do just about anything to protect their child. Even if it might be wrong. Hey BLHmistress, that really is what I'm trying to get across. I'm glad you picked up on it. Excellent interview. Thanks for the giveaway, your book cover is awesome. I'm glad you liked the interview. Lilian, trust me you're not alone in that. Thanks for posting this great giveaway, I am following you via GFC. I just read Under the Never Sky and that was very good. Nice interview, Wisteria looks like a great read. Well I hope you consider adding Wisteria to your list. I would totally buy this book I loved the interview! Hi, thank so much for the support. I'd love to hear what you think about the book. interesting ideas! Thanks for the giveaway! I haven't heard of this book before this hop, but your interview just made me so intrigued to read it!! Can't wait till it comes out! Thanks for the giveaway! Hey Jacklin, Wisteria is already out. You can pick up a copy here; http://www.amazon.com/dp/B008XRI3BA. I hope you like love stories and green eyed supernaturals, because this makes up a large part of the book too. I have a dumb question; What is GFC? Sounds good, would like to read. Thanks. How would you say does this differ from other zombie/zombie-like books in this genre? There are a lot of them out there now. Hey MC, I haven't ready any other zombie book, so honestly I don't know. But from what the reviewers say: Wisteria is first and foremost a love story between a human girl and a supernatural called Bach. His race hate humans (and have enslaved many of them)and may or may not have released Nero into the world. Bach only came to Earth to watch the planet die out of bitters for humans murdering his mother. He is not a zombie, human or interested in saving humanity. But it turns out Wisteria and Bach are part of a bigger agenda. As the series progresses we'll see less and less zombies and much more the Family and their monsters. I'm all about the zombies right now and can't get enough of them. The book sounds really good, I would def get this if I won. It's in my wish list so even if I don't, I will sooner or later be reading it. Thanks! Either way, I hope you enjoy the book when you get around reading it. I love reading about Dystopia, thanks! What about Dystopian books to you like so much? I have heard of the book Wisteria. Looks really good. Thanks for the giveaway. Where / how did you hear about my book? If you liked the cover art for Wisteria, please let me know what you think of the art work for the sequel Myopia? Thanks for introducing another new title to us and for the giveaway! I have seen this author's name around but not the title so this is great! Thanks! Thanks for the chance to win, the book sounds like an interesting read! Great interview with Lara, i really enjoyed it! Hey, thanks for stopping by. Please let me know what you think of the interview. Thank you for the lovely interview (love character interviews and this one was really interesting!) and giveaway! 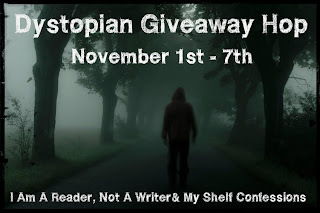 Thanks for the giveaway and the excerpt. "Wisteria" sounds interesting and is new to me. Thanks for the gift of choice as well although I may very well choose your selection. Thanks again and Happy Reading! I hope you do pick the book up. Wisteria is actually a love story first (between Wisteria and a alien Bach). The zombies are a very small part and do help set the tone, but Wisteria and her friends do not spend a lot of time running from zombies... although maybe the could. Thanks for the giveaway! I love the splash of red on the cover!! I love dystopia, especially zombies! Thanks for the great giveaway! I am new to this genre but have a few books from it on my TBR list. Have a great day! The book sounds interesting enough. I loved in the interview how you jokingly stated that your name was none of their business. LOL Thanks for the great giveaways and I hope I win. Thank you for taking part in the giveaway and congratulate Sweety White.